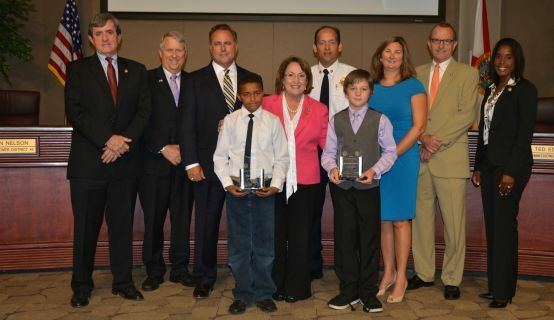 Orange County Mayor Teresa Jacobs and Fire Chief Otto Drozd III honored Isiah Francis, 10, and Jeremiah Grimes, 11, at the Board of County Commissioners meeting today for calling 911 and rescuing two small children from a burning home on June 16. The boys each received a Mayor’s Hero Award, an Honorary Firefighter plaque and a scholarship to attend the Central Florida Fire Academy when they turn 18. Additionally, community partners like SeaWorld provided goodies for the kids. Both children can be heard on the 911 call reporting the emergency. When Orange County Fire Rescue arrived on scene, two children and one adult were safely out of the structure. Crews conducted a search and rescue in the home, which was 75 percent involved, and discovered two additional children in the home. Those two children were transported to Arnold Palmer Hospital in critical condition. One child has since passed away. Orange County Fire Rescue is submitting the children’s heroic acts to the Carnegie Hero Fund Commission for consideration of honoring them with a Carnegie Medal. Orange County Fire Rescue is the largest fire and rescue department in Central Florida. It serves more than 924,000 citizens and visitors and responds to nearly 100,000 calls for service annually. A collection of photos from the Board of County Commissioners meeting are available for use by the media on Flickr.